More Mundane Updates from My Grinch Cave: I’m a Columnist! Yesterday, I posted this photo on Instagram about a recent some-some I wrote about the DREADED. QUARTERLIFE. CRISIS. 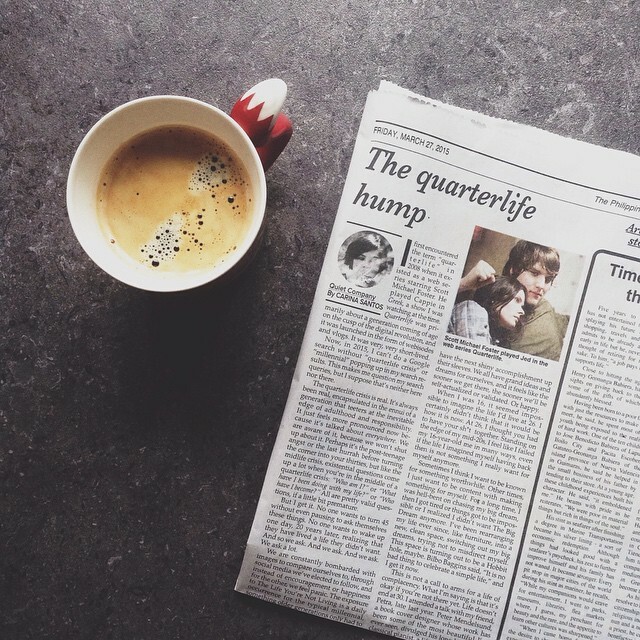 Anyway, I posted this disgustingly staged photograph of the broadsheet next to my morning cup of coffee (it’s delicious) and this meant to serve as a subtle announcement of “Quiet Company,” aka my very own column, aka the thing I have been waiting for since I started writing for The Philippine Star. Isn’t that nuts?! I was going to go with “Gutter Prose” as a column name, but it’s not very “me,” I very sadly had to admit. You can read my verver first piece here. I promise the photo of Cappie will still be on the page. I’ve gotten overwhelmingly positive feedback and support for it, so thank you to everyone who has extended words of support. It really means a lot and warms my little ol’ Grinch heart, but then that might be the 32° weather we are having right now. I’m so happy I still get to write for SUPREME, too. I’ve been really inconsistent with work lately, because I’ve been going around a lot and getting trapped in my “unmotivated state,” but I am pushing myself because I know I can do more with what I am given, which is another realization I had last week. — ‘Yoga Pants are Ruining Women’ and Other Style Advice From Fran Lebowitz: Haha, this one’s a doozy. I don’t necessarily agree with everything, but the way she is so sure and unapologetic about her opinions is so hilarious to me that I can’t help but like her a lot. — Fascinating Photos of Reindeer People Living in Mongolia: Must Freaking Click. Seriously. — hang on, my love, and grow big and strong: a letter from Iggy Pop to a fan in 1995. — The Animals in My Home by Laurel Fantauzzo: I don’t know if it’s because I know them in person, but this piece was so gripping and vivid to me. Fun read whether or not you live in Manila! Hehe. — Harper Lee’s To Kill a Mockingbird on Call Me Ishmael: Call me Ishmael is a great project itself, but here’s an anonymous voice mail (with a typed-up video) from a reader on the timelessness of TKAM.